Sometimes, whilst training for an event such as the marathon, or even shorter distances, we find that self- doubt creeps in. This is normal but can hold us back from achieving our best. To overcome this, we can use self- talk to help our self -control, keep up our morale and change our mindset. Here are 4 steps (Recognise, Stop, Respond, Focus) to developing a positive mindset to get you through your training sessions and the marathon itself. As with most areas in our lives, at some time we experience negative thoughts, recognising these is the first step to beating them. Sometimes, we don’t recognise them, so it’s useful to take time to reflect on your thoughts and consider – are you saying I can’t too many times? are you dreading your training runs/ gym session? Are you focussing on your personal weakness? Or thinking about factors out of your control such as the weather? Stopping negative thoughts is much easier said than done! Remember everyone running the marathon will be facing their own challenges and will face the same variables during training or the race. Try to focus on the positive rather than the negative; challenge those negative thoughts, ask yourself what is the evidence for those thoughts? If replacing negative thoughts with positive thoughts is too hard today, just fake a smile, it has been shown that simply smiling can improve your mindset, just try it. Then start to tackle those negative thoughts! Remember to focus on what you can do, rather than what you can’t do. You can finish your training runs, your gym sessions, workouts and indeed the marathon itself! Take time to consider all of the training and goals you have achieved so far. You might find it useful to write a journal to record your progress, so on difficult days you can see how much you have accomplished and notice all the success you have built up. 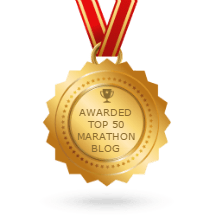 My last thoughts on self- talk, it’s best to practice it as part of your training programme, then if you need it whilst running the marathoner, it will be so much easier to put into practice.